First, we braved the ice and snow to trek to Pu Pu Hot Pot to pick up some pork fried rice. Following the traditional Rice Krispy Treats recipe, we combined 3 cups of fried rice with half a package of marshmallows in a saucepan. We decided to omit the butter because the fried rice was already quite greasy. We stirred the ingredients slowly over low heat until they were thoroughly blended. 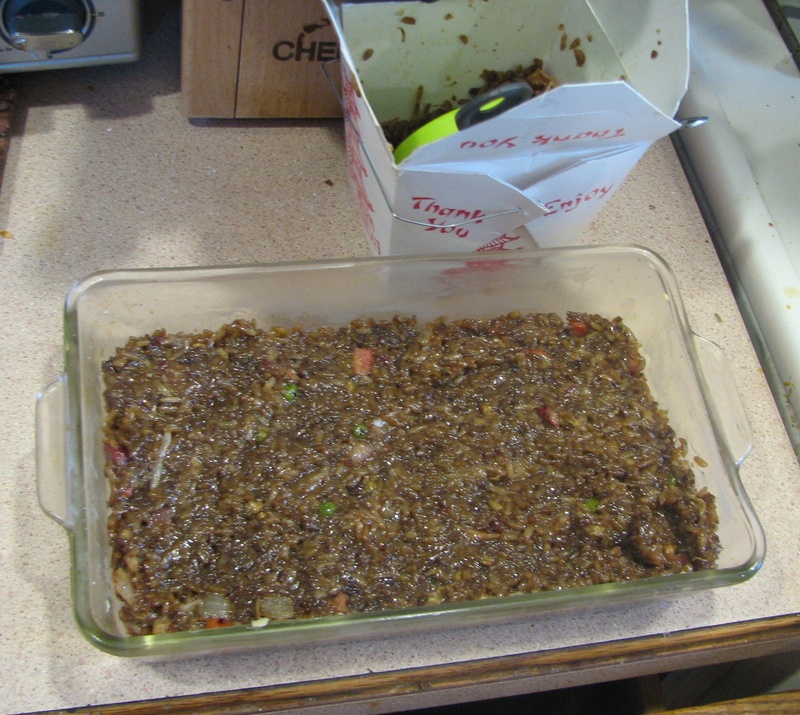 Then, we pressed the mixture into a buttered baking pan and refrigerated the pan until the “treats” solidified. Kristen was concerned that the fried rice was so oily that the usual amount of marshmallows would not be sufficient to make the final product stiff. And it turned out she was right. 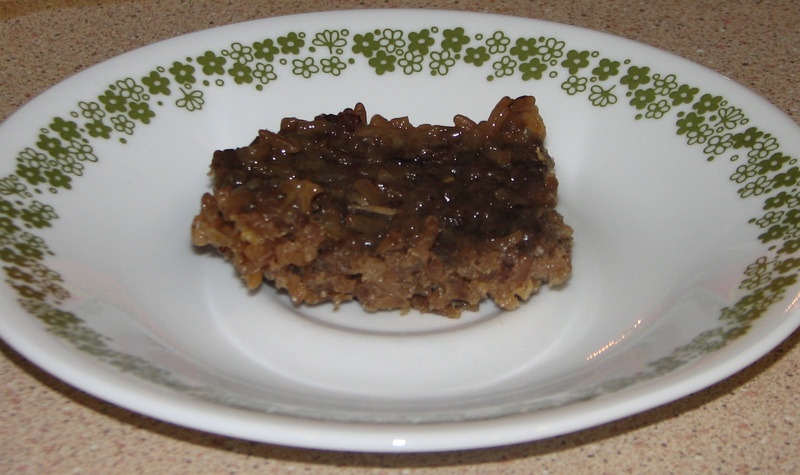 The initial batch of treats could not be cut into squares and removed from the pan. It was more of a rice sludge with marshmallow overtones that tasted mostly like pork fried rice but a bit sweeter. It was almost like what you might imagine would happen if you made fried rice from sweet and sour pork but a little stickier. 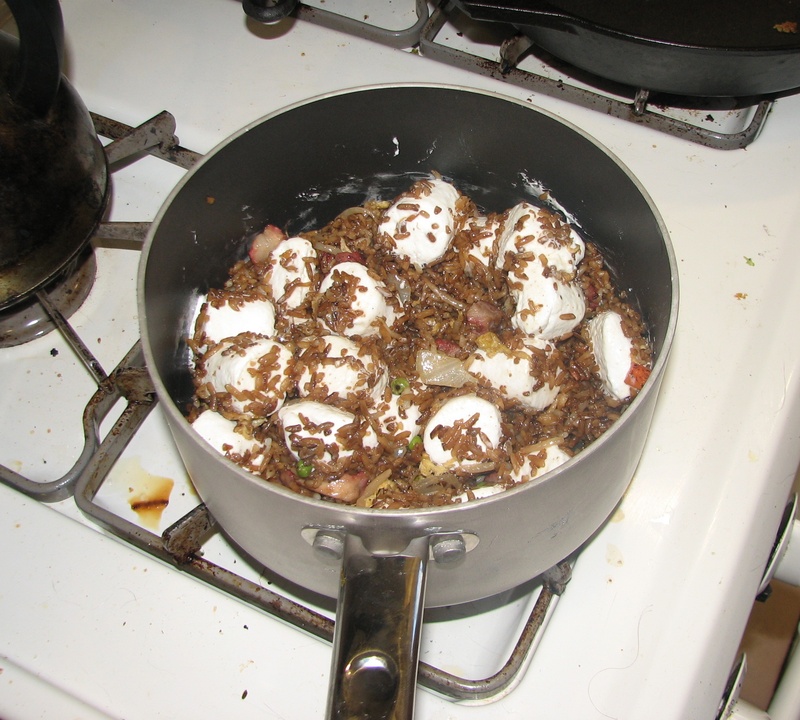 We scraped the first batch of treats back into the saucepan and melted in another half-bag of marshmallows. (We actually had to buy more marshmallows for this step. The second half of our first bag was left sitting on top of the toaster oven, and it melted into its plastic wrapping.) Then, we let the second attempt at fried-rice krispy treats cool and stiffen. These fried-rice krispy treats could actually be to cut into squares. Beth: I am usually a big fan of sweet&savory, but it just didn’t work here. The sweetness of the marshmallows was too much. And the texture was just weird — too hard for fried rice and too soft for rice krispy treats. I had a lot of hope for this recipe, but it failed. Alex: The texture in this was terrible, although it was pretty bad in the fried rice even before we added the marshmallows. We should try taking rice krispies and making fried rice out of them instead. Kristen: The first batch, with only half a bag of marshmallows, had just a hint of marshmallow flavor, which was probably all that was necessary. It gave the fried rice a certain je ne sais quoi. Perhaps using less greasy fried rice (after all, we did optimize *for* greasiness here) would have led to a better result? I feel like this could work really well with a drier fried rice, maybe using rousong? Hmm, we do have a tub of pork sung and one of pork fu that have been in the kitchen waiting to be used for a while. I wonder how just “pork krispy treats” would taste. It’s so hard to know what to do with leftover fried rice, if it even gets near the fridge it turns into gravel. You have found the way forward here friend. I missed the hyphen also. This seems like a stepping stone to greatness. I threw up a little in my mouth when I saw the picture that looked like marshmallows covered in maggots. Yout have thrown me off chinese food for quite some time …..